Anesthesiology is an important medical specialty provided by highly skilled anesthesiologists. Anesthesia care also is provided by certified registered nurse anesthetists (CRNAs) and anesthesiologist assistants (AAs). There are approximately 35,000 anesthesiologists, an equal number of CRNAs, and 1,300 AAs actively practicing in the United States. In most states, CRNAs must work under a physician’s supervision. However, 16 states now have opted out of this requirement. Anesthesiologists typically are anesthesia care team leaders and either personally provide anesthesia or oversee CRNAs and AAs. Anesthesiologists have the medical training to manage the overall health of patients when they are at their most vulnerable. There has been growing concern over whether the U.S. is facing a shortage of anesthesia providers. The ramifications of such a shortage are significant. “A shortage of anesthesiologists could limit access to high-quality care, especially in light of the growing demand for surgical and interventional procedures for our aging society,” says Mark A. Warner, MD. Markets for highly specialized medical services are difficult to balance, but understanding current and future demand and supply for anesthesia services may help policymakers, regulators, and professional groups in addressing the problem before it gets out of control. Many factors can play a role in national or local shortages, especially poor workforce planning. This may include limits on the number of training positions, regulations of permission to practice, and limits on earning capacity, especially for anesthesiologists who wish to work in rural areas but have payment limited by Medicare rules that do not apply to CRNAs. A recent study from the RAND Corporation was conducted to assess whether there is currently a shortage or sur of anesthesia providers. 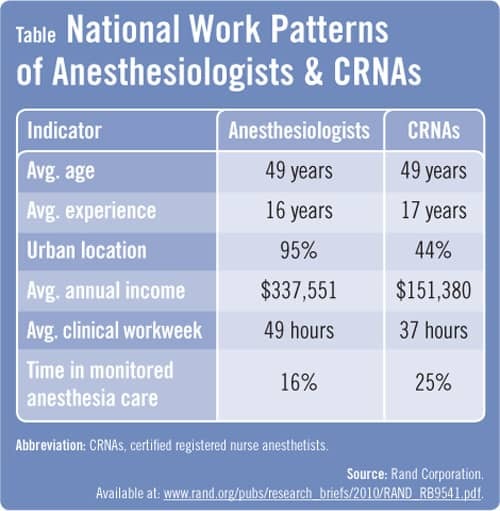 It also examined demographic patterns, employment arrangements, usage of time across different procedures, and working patterns that currently exist in the labor markets for anesthesiologists and CRNAs. Investigators conducted a national survey of anesthesiologists, CRNAs, and hospital anesthesiology directors, and used an econometric model that drew data from these surveys. It incorporated state-level variables to estimate the supply of and demand for anesthesiologist and CRNA services. It did not evaluate AA services. Data from the RAND survey showed that the U.S. has a current shortage of about 3,800 anesthesiologists and 1,280 CRNAs, representing 9.6% and 3.8% of the total anesthesiologist and CRNA workforce, respectively. Importantly, a dramatic shortage of anesthesiologists and a significant sur of CRNAs are projected by 2020 if current trends continue. The study projected a shortage of about 4,500 anesthesiologists and a sur approximately 8,000 CRNAs within 10 years. If the growth in demand is assumed to be 3%, accounting for the aging population, the shortage of physician anesthesiologists may reach as high as 12,500 by 2020, while the supply of nurse CRNAs would be at equilibrium. Shortages of anesthesiologists were spread evenly across all regions in the country. 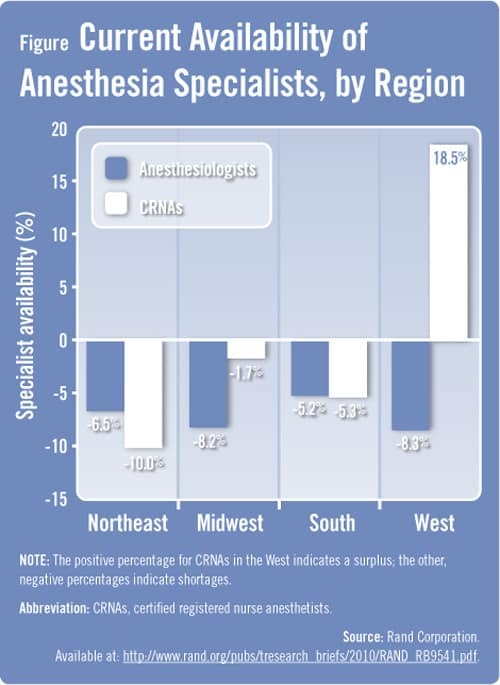 Shortages of CRNAs were more pronounced in the Northeast, while some states in the West showed sures (Figure). Rand Corporation. Is there a shortage of anesthesia providers in the United States? Available at:http://www.rand.org/pubs/research_briefs/2010/RAND_RB9541. Daugherty L, Fonseca R, Kumar KB, Michaud P-C. An analysis of the labor markets for anesthesiology. Santa Monica, Calif. RAND Corporation. TR-688-EES. 2010. Available athttp://www.rand.org/pubs/technical_reports/TR688/. Cromwell J, Rosenbach ML, Pope GC, Butrica B, Pitcher JD. CRNA manpower forecasts: 1990–2010. Med Care. 1991;29:628-644.
other medical specialties. Mayo Clin Proceed. 2001;76:969-970. Mark A. Warner, MD, has indicated to Physician’s Weekly that he has no financial disclosures to report. Hypertension Trends in the U.S.
Wrong again! There are more than 50000 CRNAs now… and they are more cost effective… and actually don’t need you to supervise them or watch as you commit fraud against medicare… since there is no way you can be in more than two emergencies at the same time. Also, Alice Magaw was the first “anesthetisia provider” at Mayo. Gotta love it!